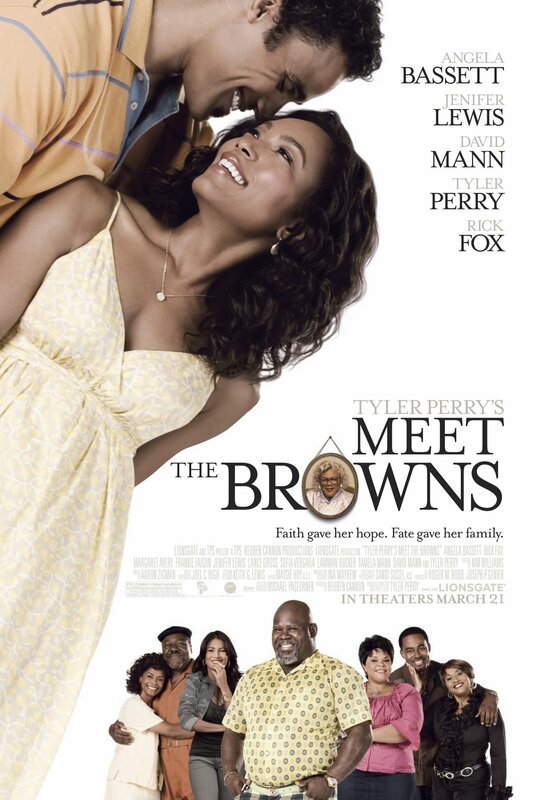 And here is the final poster for Tyler Perry’s Meet the Browns, which ditches the general design of the two previous teaser posters and goes for a more ‘everything but the kitchen sink’ approach. As some of you probably remember all too well I really liked the first Meet the Browns teaser and deeply disliked the second. This final poster strikes me as much better than the second simply because it has a more attractive design and doesn’t rely on very lame humor. But it has nowhere near the elegant simplicity that made the first one so endearing. Its design is, in fact, very cluttered. By I have to admit that it does have some strengths. Main among them is that this poster gets across the idea of meeting a big, strong, loving family very clearly, something that the other posters either failed or didn’t even try to do. It also makes the presence of a love story evident and gives eye candy in the form of Angela Bassett and Rick Fox. It is not the kind of poster one might want to hang in a a wall, but because it has all those elements it just might work well with the intended audience. One sees the poster and gets a good feeling for all the elements that will be present, and they all look very familiar and comforting. Still, I dislike the approach of selling a film by showing a laundry list of appealing things. It’s generally much better to choose one thing, or at least a theme, and try to sell that very well. It also tends to lead to better designs. I personally like this poster the best. I think that it is more engaging and telling than the previous two. I definitely am looking forward to seeing this movie!